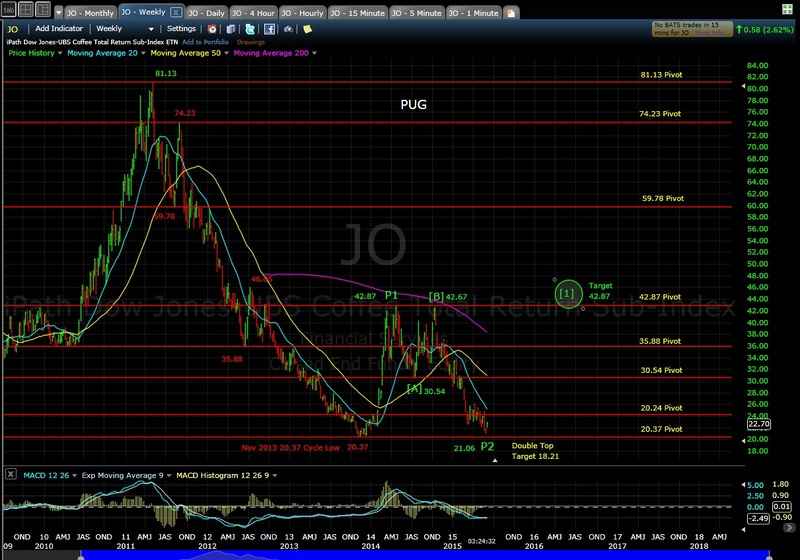 6:30 pm EST: The updated weekly chart for US Grains (CORN, WEAT, JJG) and Coffee (JO) are below. 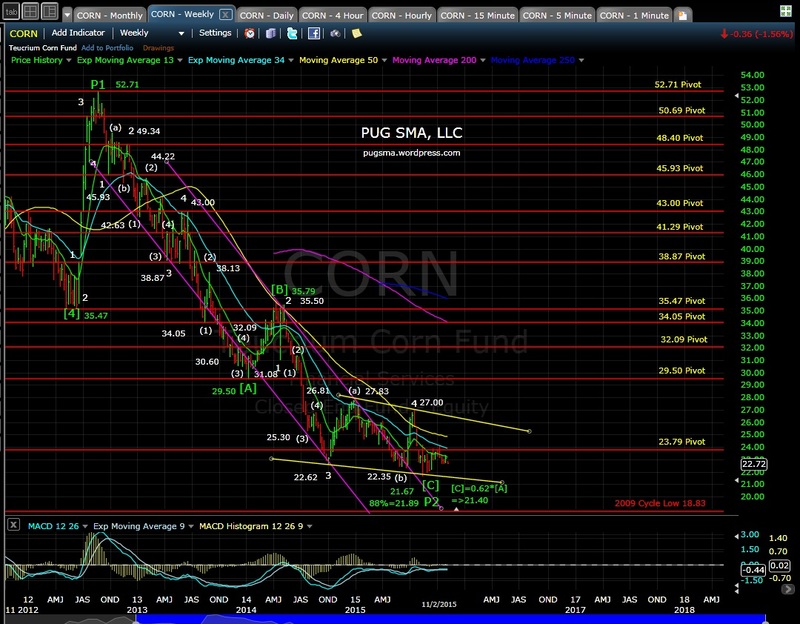 Here are the soft commodities update for November. 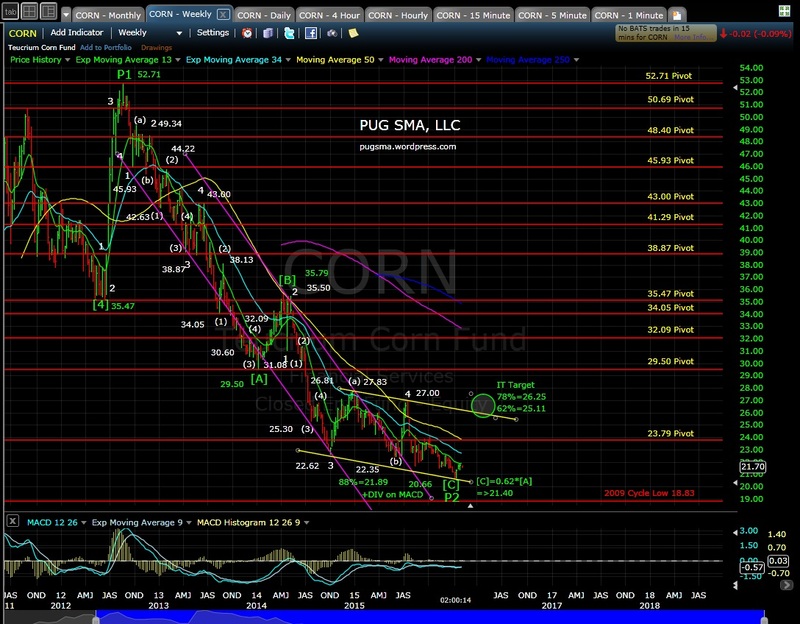 5:25 pm EST: A long and strong weekly positive divergence has developed across the MACD of CORN, WEAT, JJG and JO. 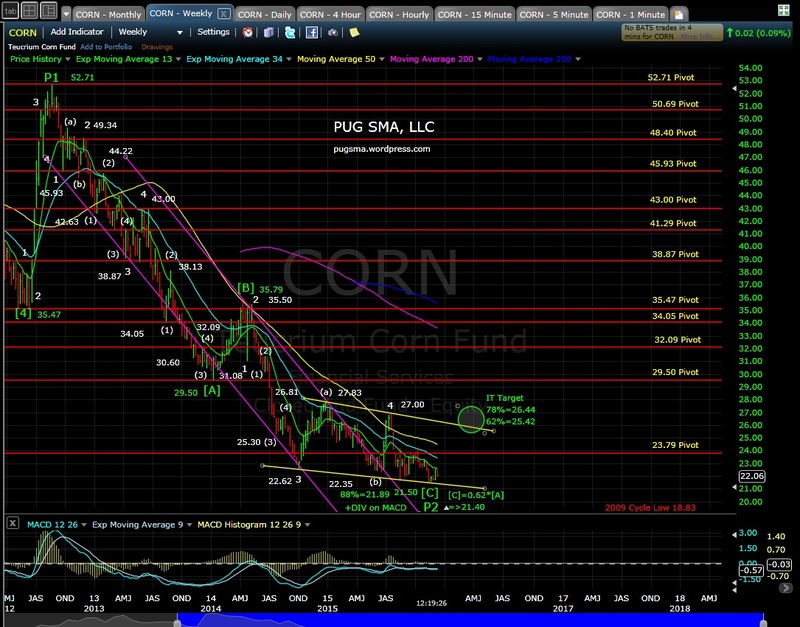 5:55 pm EST: The soft commodities (CORN, WEAT, JJG, JO) are all getting interesting here after a 3rd push down to slightly lower lows. 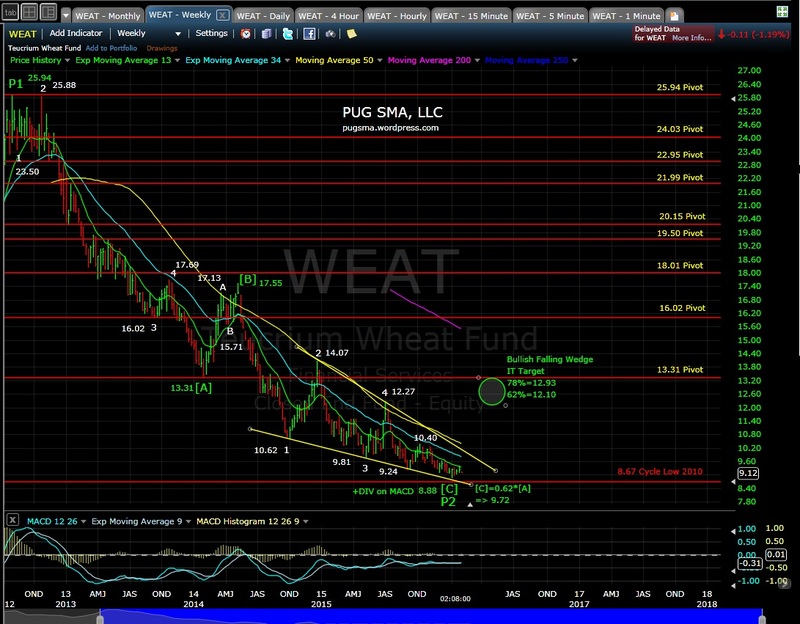 The weekly MCAD’s are showing a positive divergence. 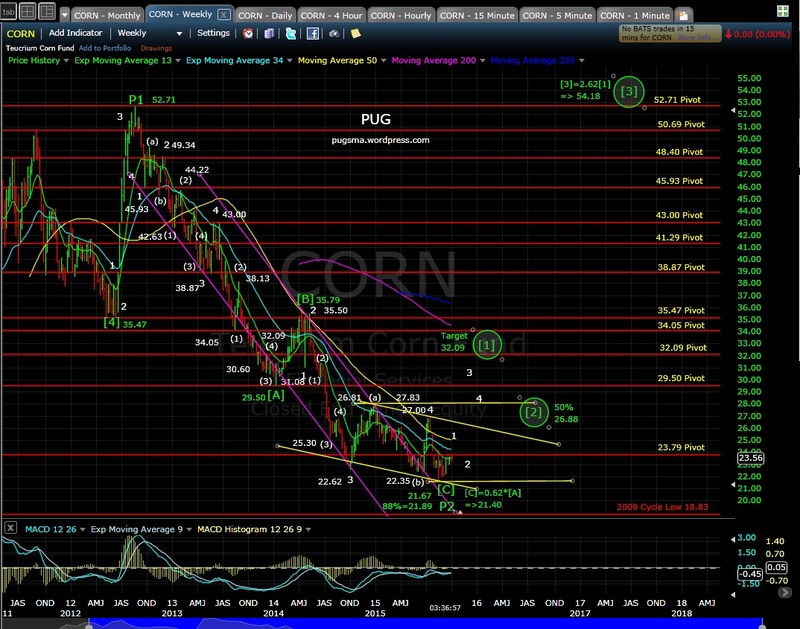 CORN (weekly): ST target 26 and IT target 32. 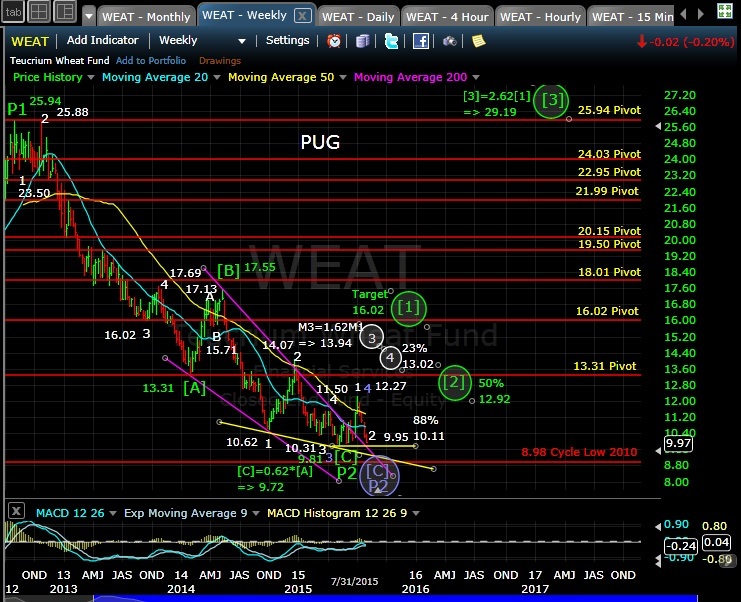 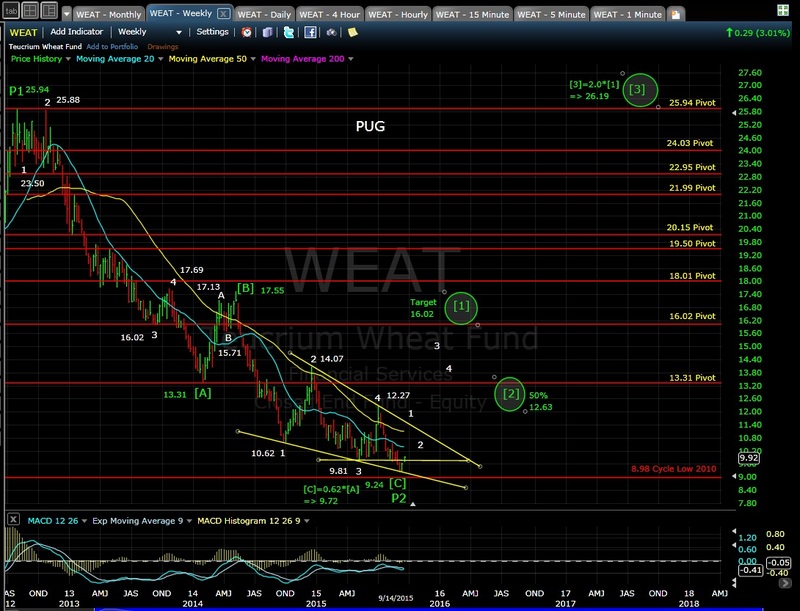 WEAT (weekly): ST target 12 and IT target 16. 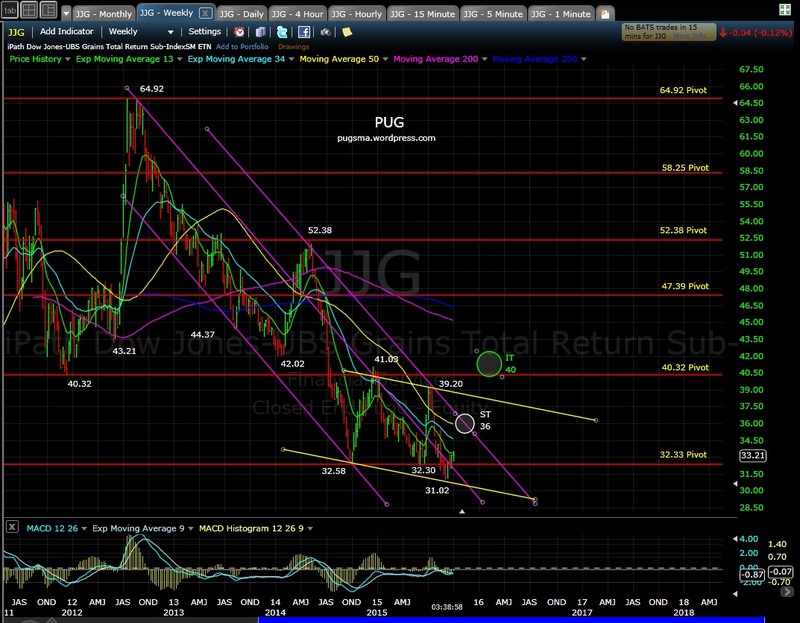 JJG (weekly): ST target 36 and IT target 40. 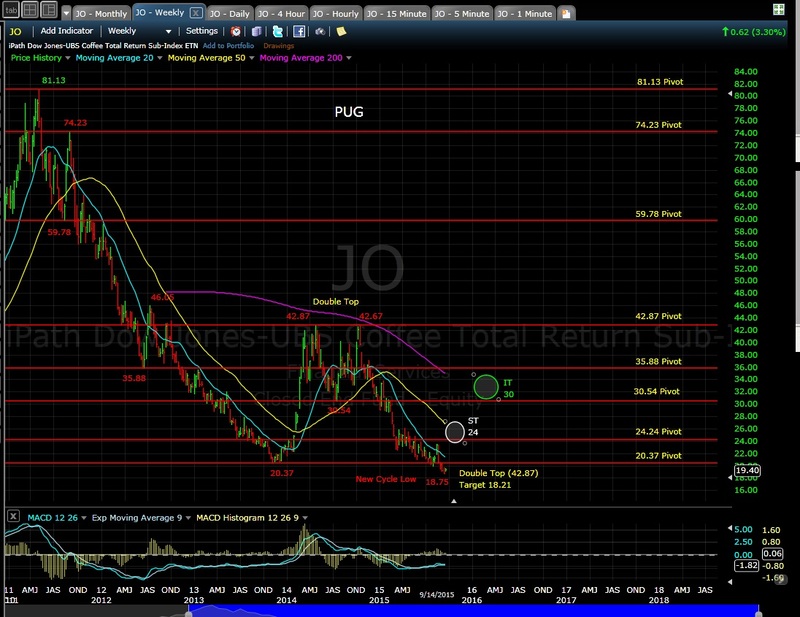 JO (weekly): Reached it’s double top target of 18.21. 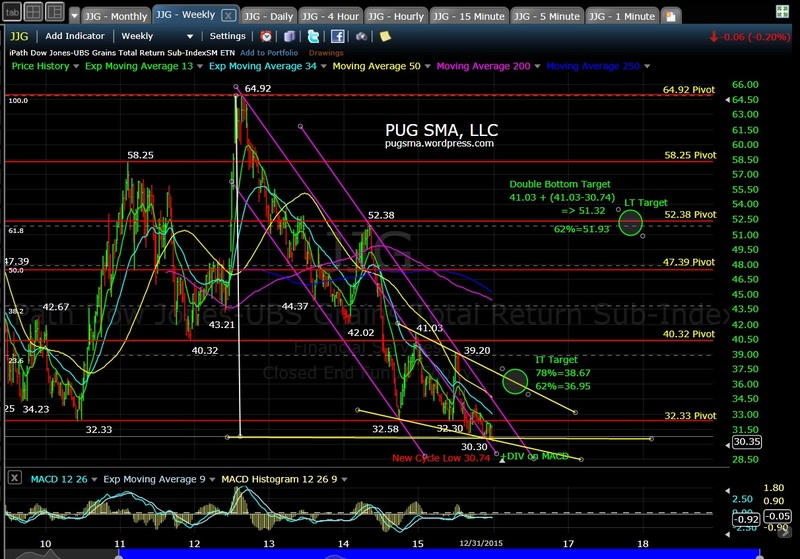 ST target 24 and IT target 30. 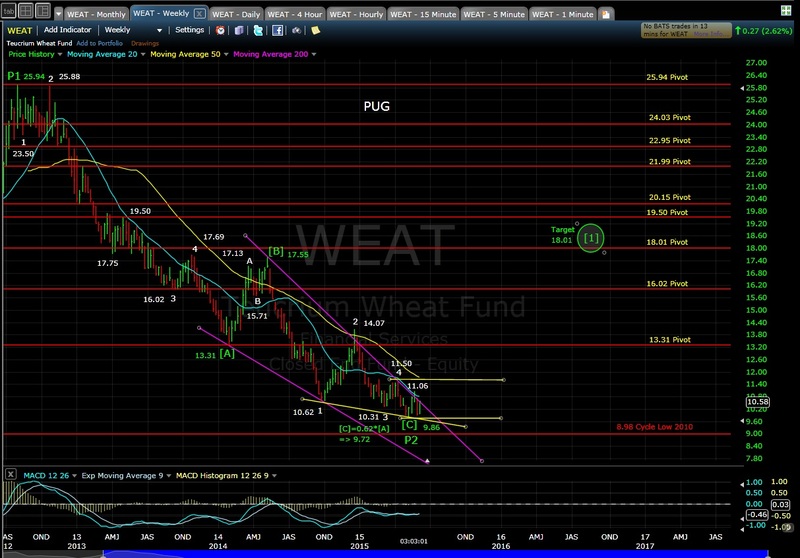 2:00 pm EST: Both CORN and WEAT are at the 88% retrace limits for this minor wave 2. 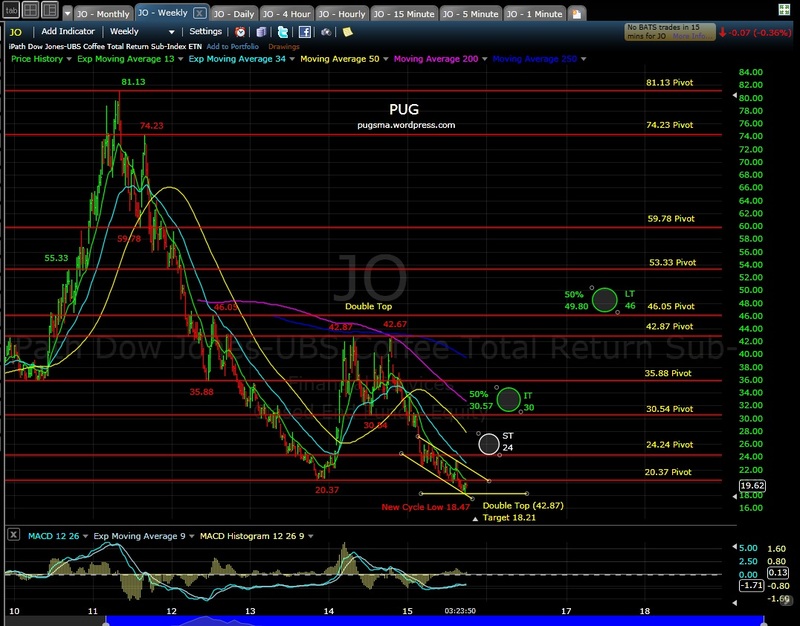 A break of the their recent lows of 22.35 and 9.81 could lead to test of their 2009/2010 Cycle lows of 18.82 and 8.98. 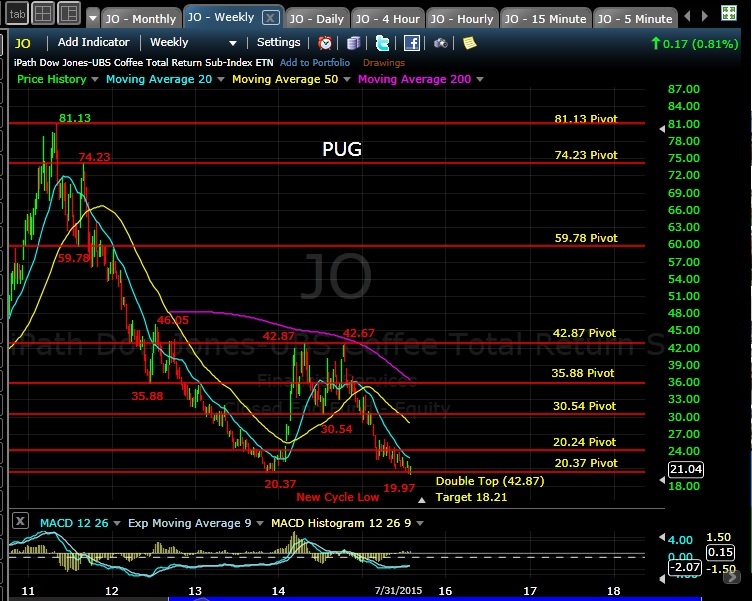 JO this past week already set a new cycle low below 20.37 at 19.97 and could be headed for the double top (42.87) target of 18.21. 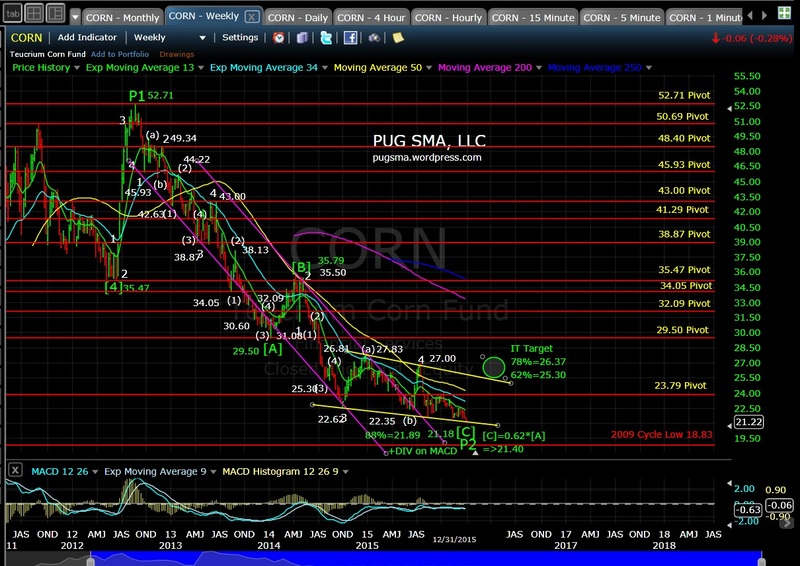 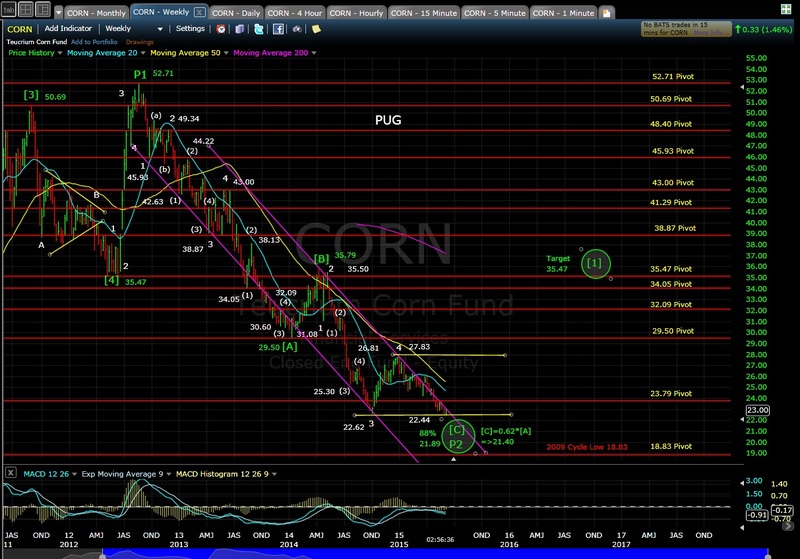 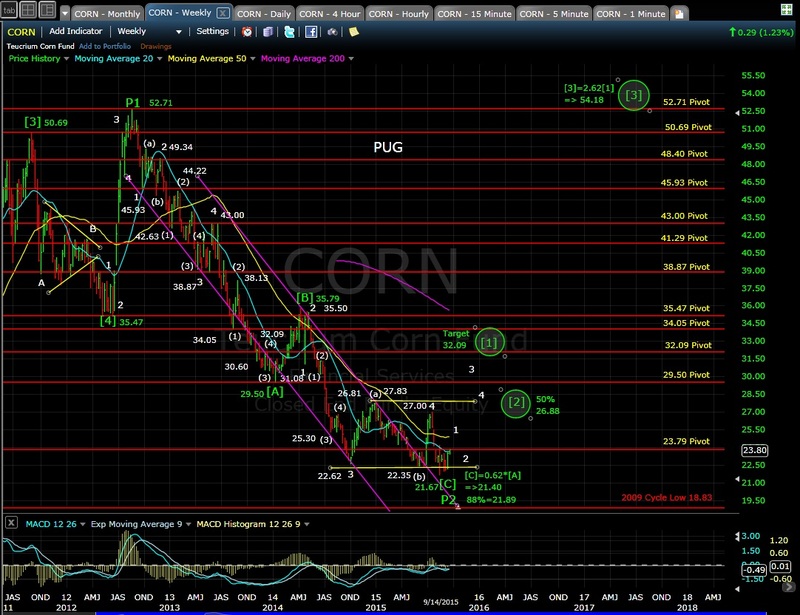 CORN weekly chart: New low on CORN at 22.44 with potential weekly MACD +Div. 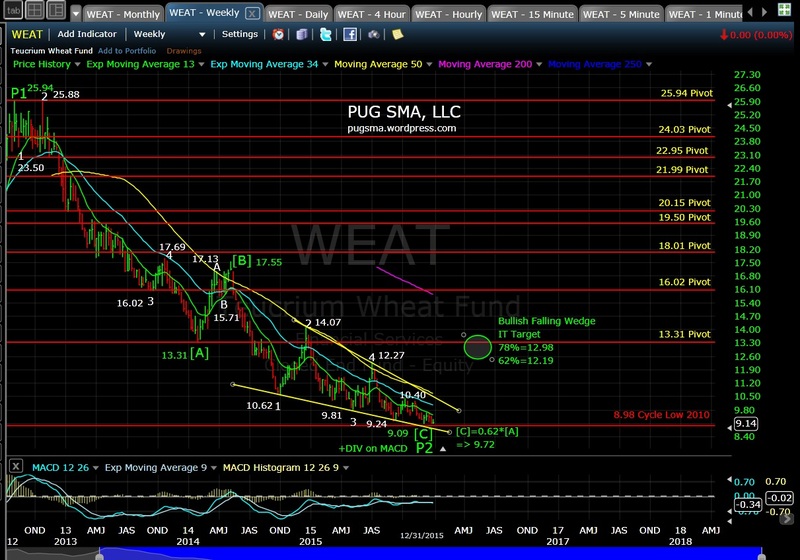 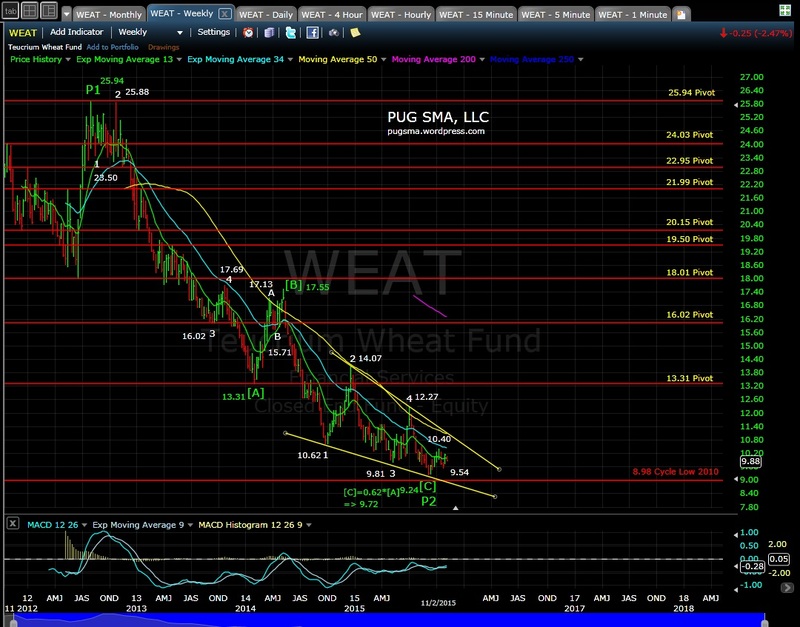 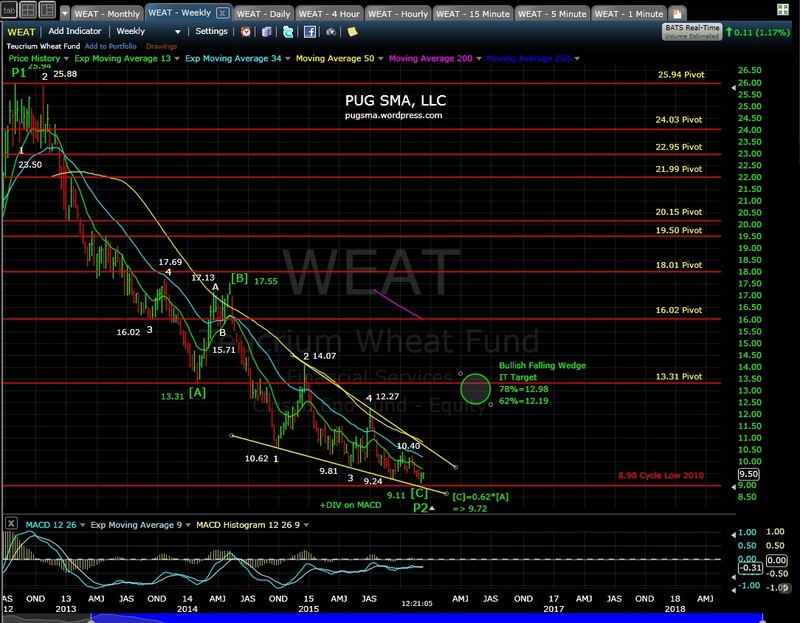 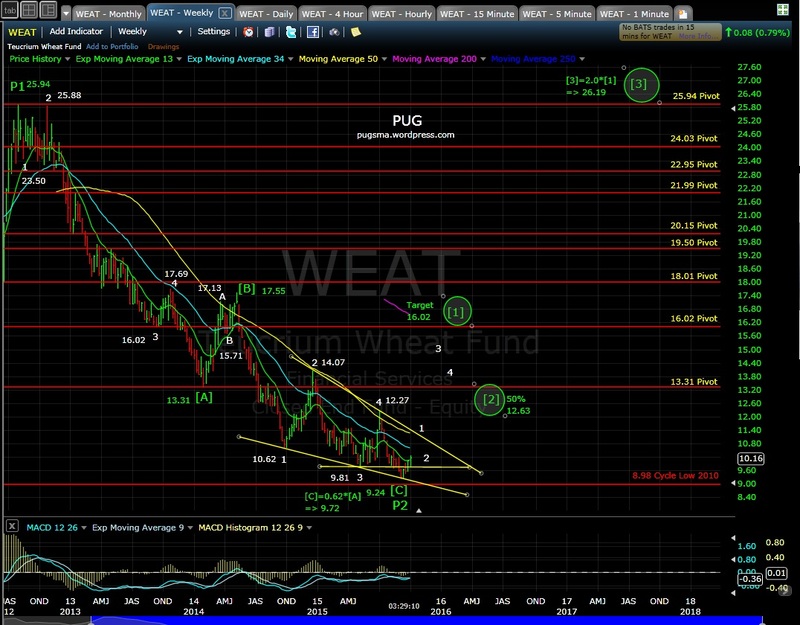 WEAT weekly chart: The 9.86 low is holding so far with potential weekly MACD +Div. 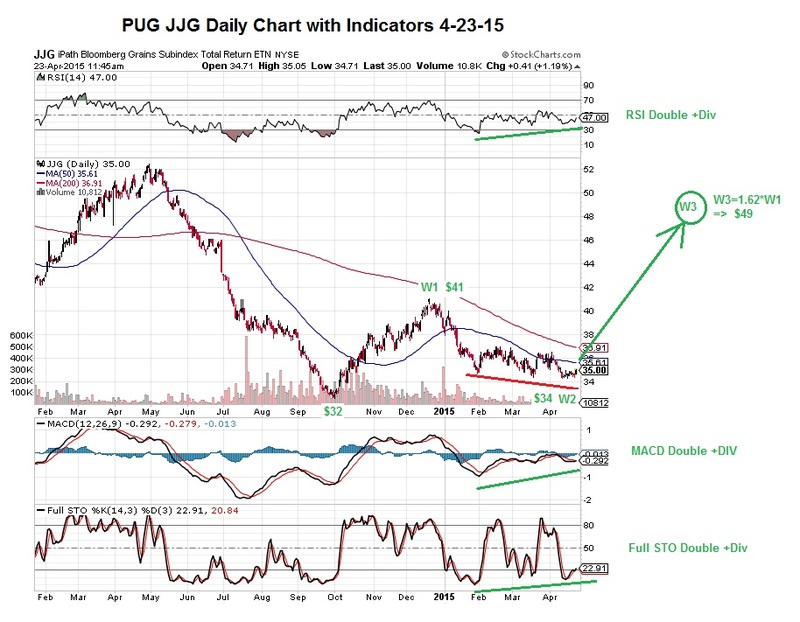 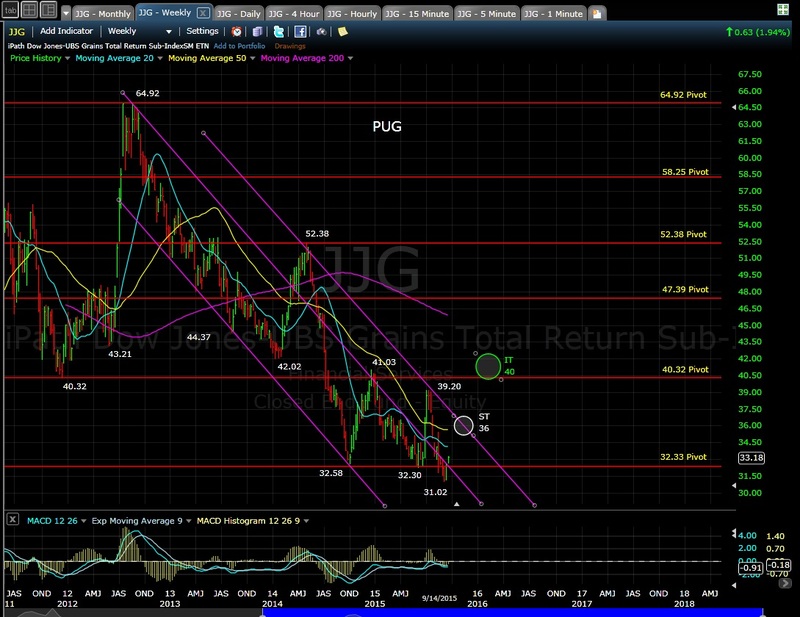 JJG weekly chart: New low on JJG at 32.30 with potential weekly MACD +Div. 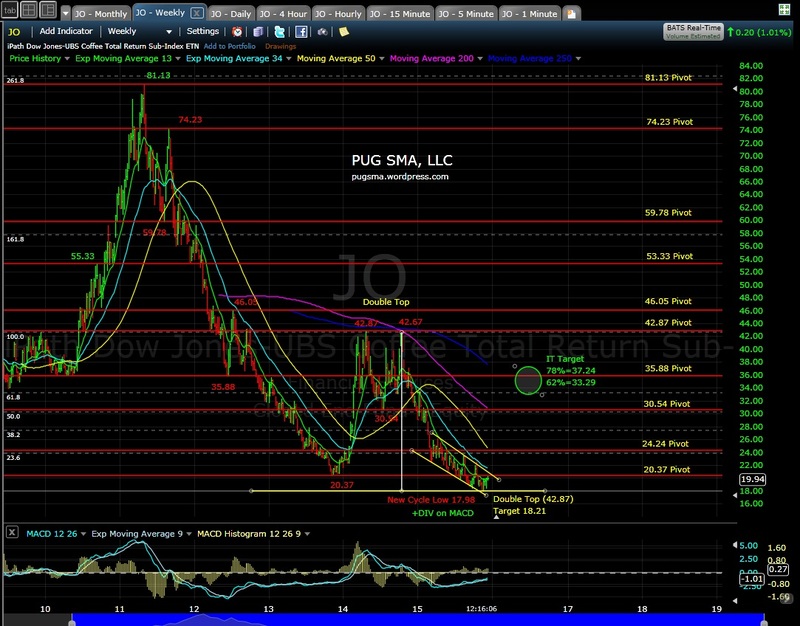 JO weekly chart: Nov 2013 low of 20.37 holding thus far. 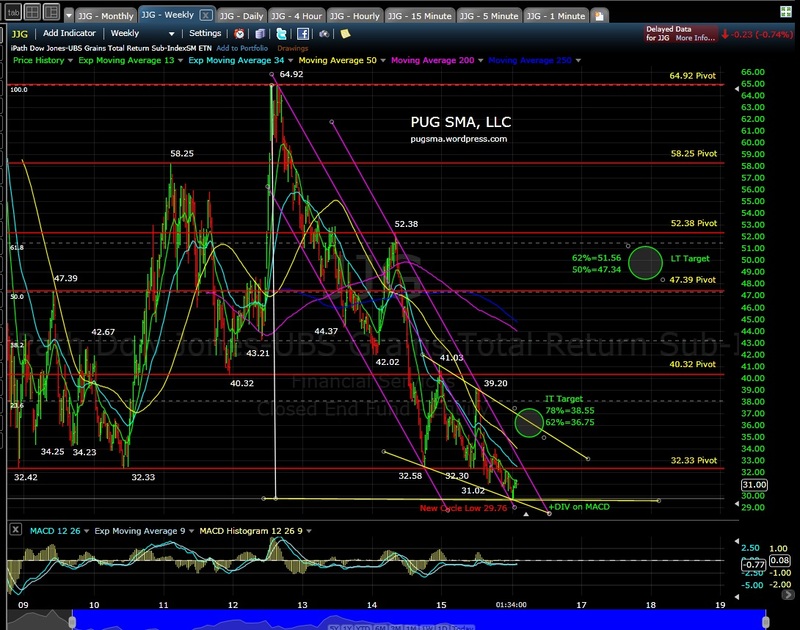 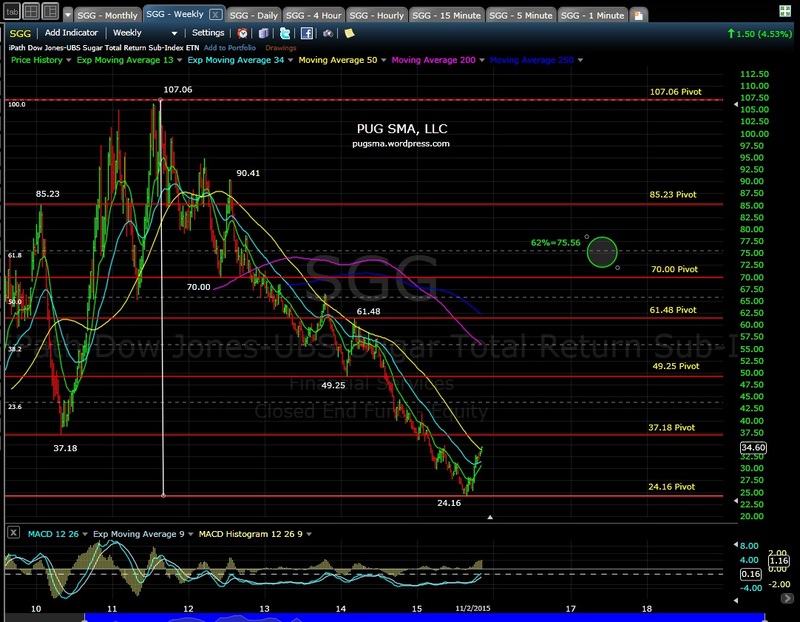 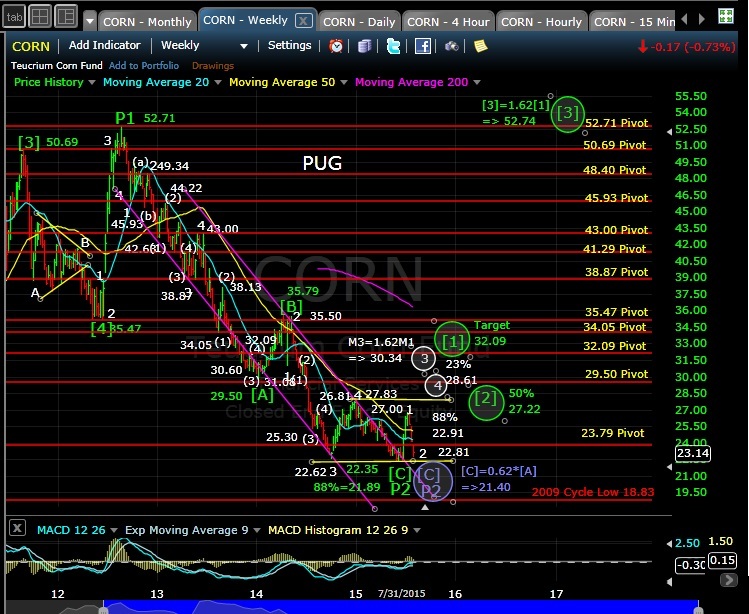 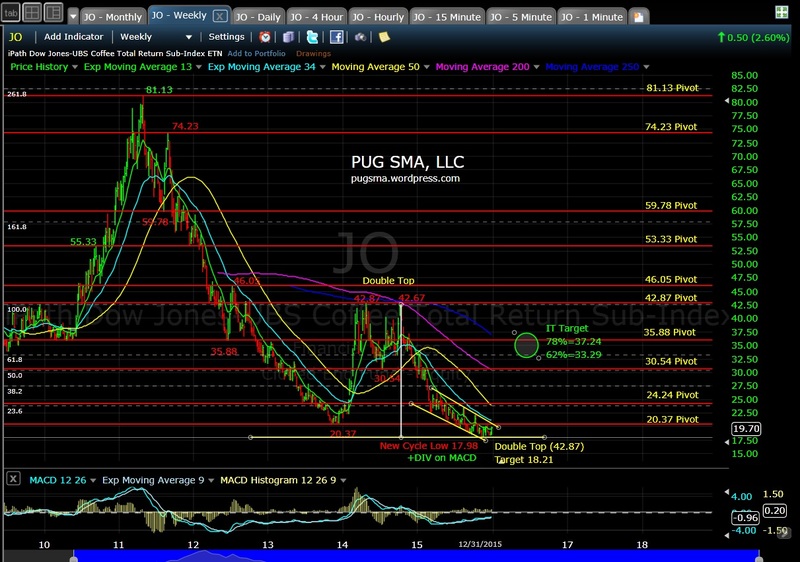 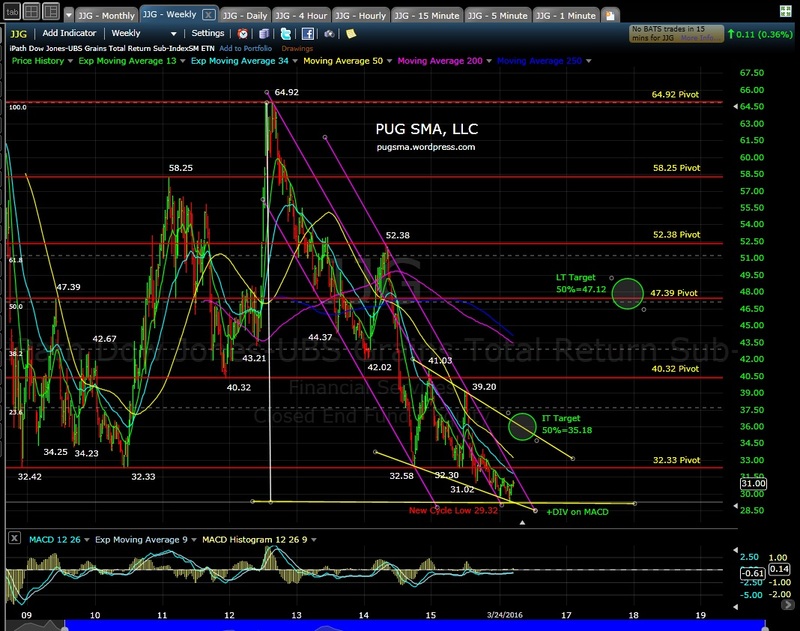 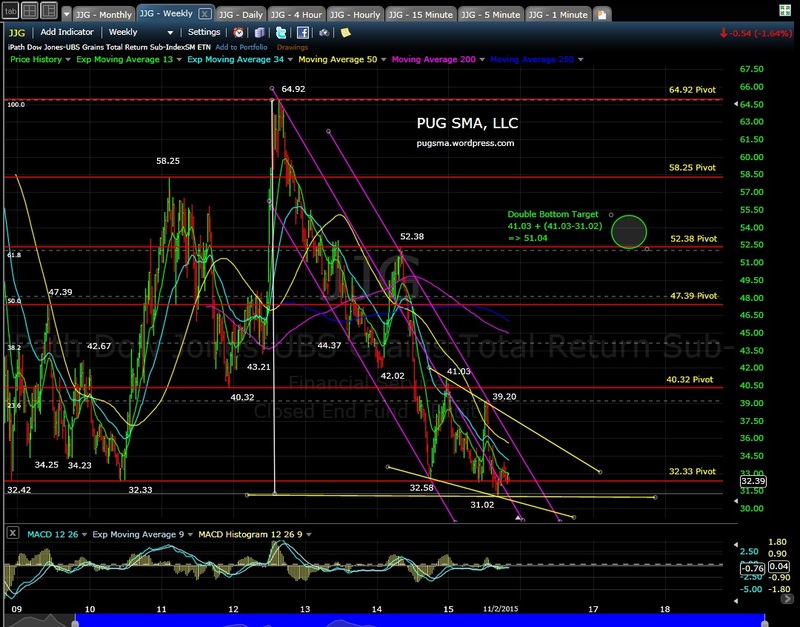 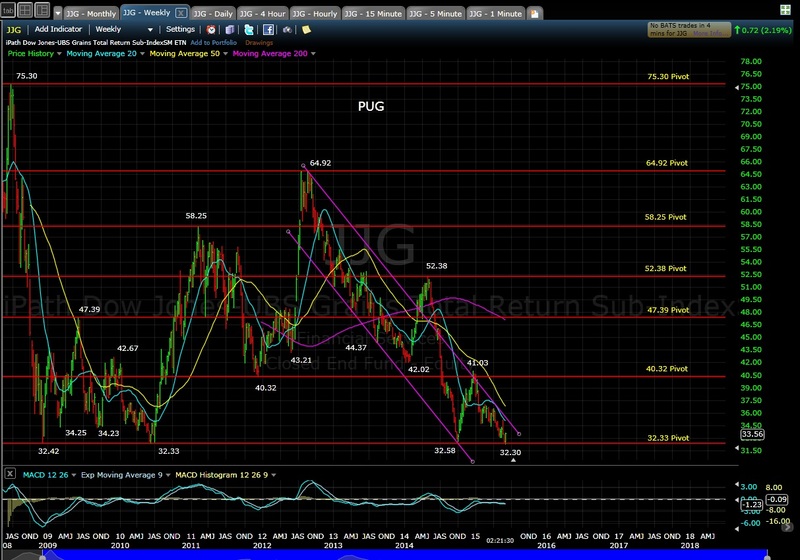 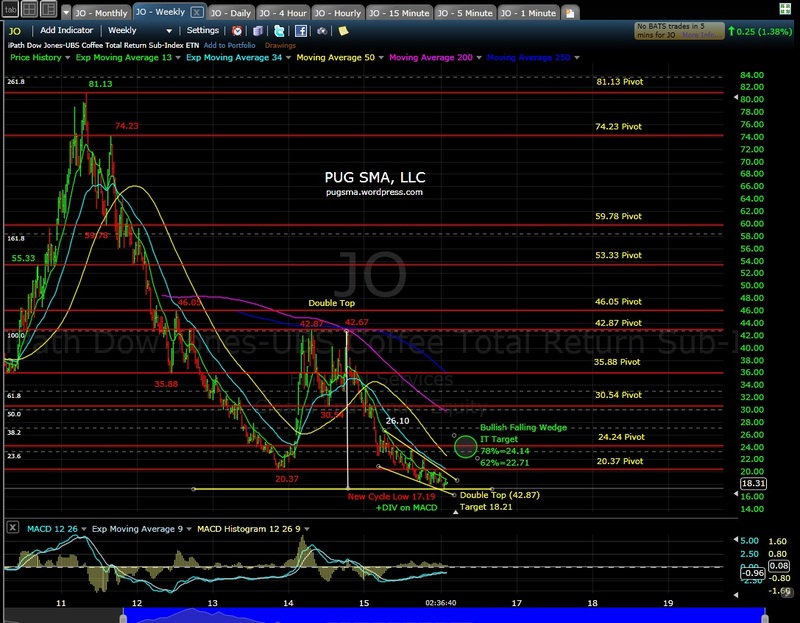 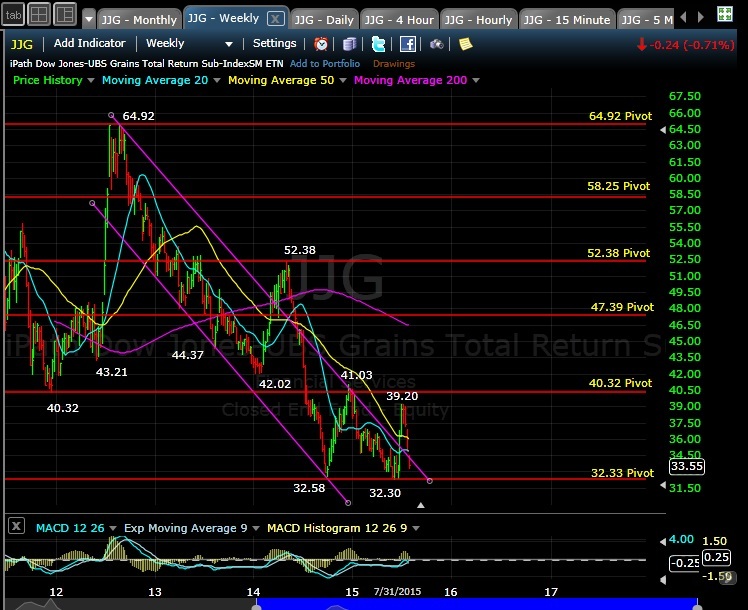 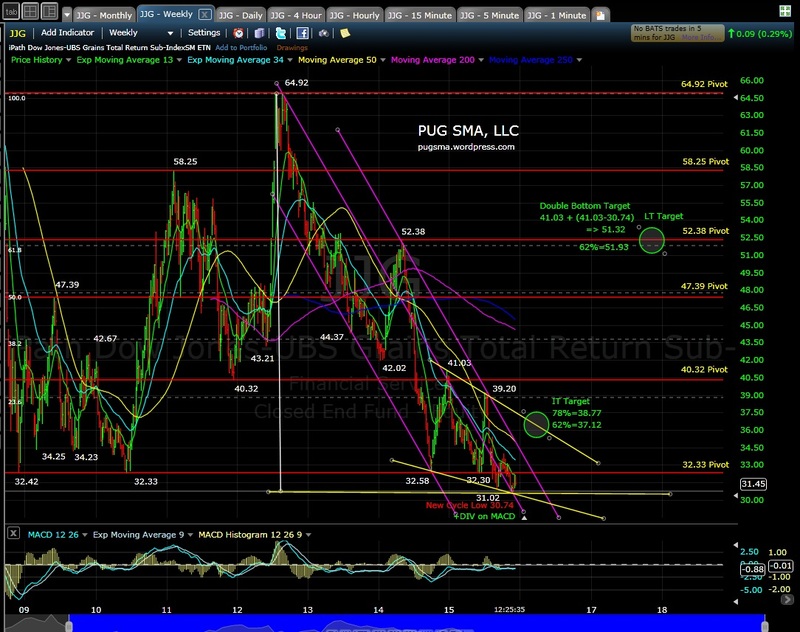 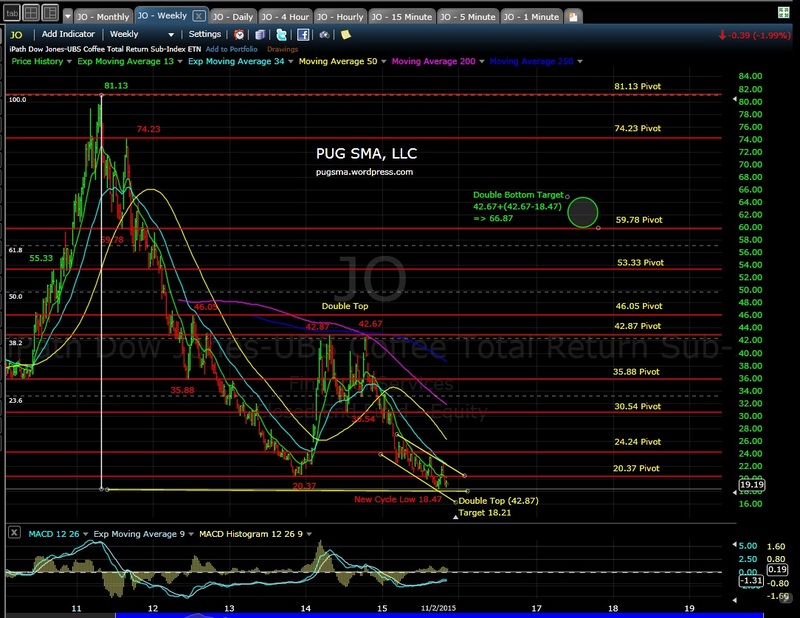 US Grains (JJG) are looking very interesting here at $34-$35.